Macaroni salad is a ubiquitous cookout side dish, but it can become a bit boring as the summer goes on. 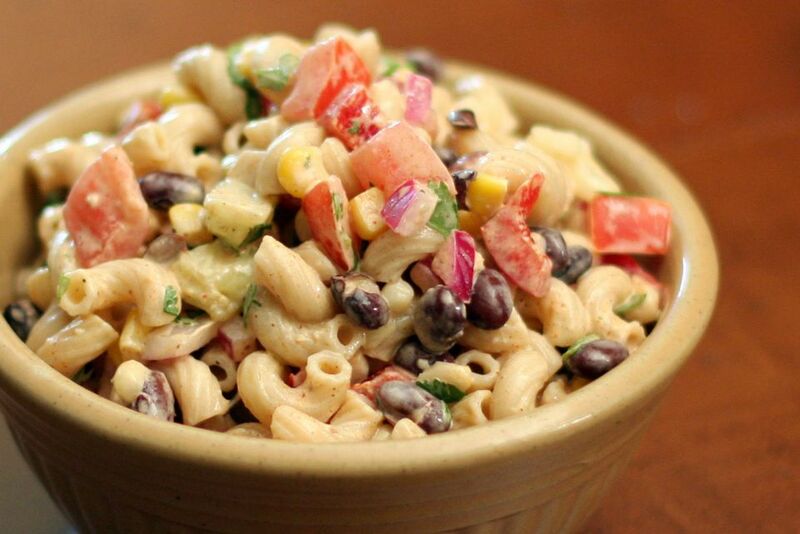 So next time, surprise your friends with this Tex-Mex style macaroni salad. Cilantro, corn, black beans, diced fresh tomatoes, and the flavorful dressing make this pasta salad unique. The dressing, a kicked-up chili-seasoned mayonnaise with lime juice, gives it a distinctive Southwestern flavor. This macaroni salad is great with burgers, grilled chicken, steaks, and chops. Cook macaroni in boiling salted water following package directions. Drain in a colander and rinse under cold water. In a large bowl, combine the cooled macaroni, tomatoes, bell pepper, onion, cucumber, beans, corn, cilantro, and garlic and toss to blend ingredients. In another bowl, combine the dressing ingredients, stirring to blend. Pour over the macaroni mixture and gently stir to blend thoroughly. Chill and serve. Sometimes using an unexpected pasta shape can change the whole look of a dish for the better. Instead of the standard macaroni, use another tubular pasta like mini penne; or try a fusilli (corkscrew) or farfalle (bow tie). Any pasta that has ridges or nooks and crannies is best to allow the ingredients to cling to the noodles and the dressing to coat well. This is the type of recipe you can eliminate, change, and add ingredients to your liking without compromising the dish. If you don't like red onion, leave out; if your fridge is void of cucumber, eliminate. If you have a perfectly ripe avocado on the counter, by all means, cube and add (at the very end). If you dislike cilantro, replace with fresh parsley. Feel free to include black olives, or swap the black beans for red kidney beans. And grilling the corn will contribute a nice smokey flavor to the salad. You can also add some spice to this dish by tossing in some finely chopped jalapeno peppers or adding some cayenne pepper to the dressing. Summer is a great time to cook up and enjoy a variety of pasta salads. They are easy to make ahead and can be packed up to bring to neighborhood barbecues or a day at the beach. Sometimes the best combinations are using what you have on hand in the pantry. This 30-minute tuna macaroni salad may remind you of your childhood (think: tuna noodle casserole), but with chopped red and green peppers and a bit of lemon juice, it is a light salad that should be served cold, perfect for a hot summer day. Macaroni salad with cheese and ham is like the best ham and cheese sandwich you ever had turned into a salad with pasta. Cooked ham and shredded cheese are combined with celery, onion, peppers, and pimento and dressed with mayo, mustard, and relish. Also,​ a nod to a lunch favorite, this pasta salad with chicken and bacon may remind you of a chicken club, with its mixture of crispy bacon, cooked chicken, tomato, and mayonnaise.